What is a burger? Is it merely a beef patty between two buns? Or is it something deeper, spiritual, a satisfaction of one's most carnal culinary desires, maybe even something naughtier? 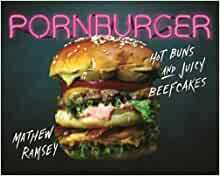 Mathew Ramsey takes the foodporn movement to its unabashed pinnacle with PornBurger. Inspired by his wildly popular blog pornburger.me (with over 2,400,000 visitors), Mathew has been steadily building his battalion of burger mongers with wild yet accessible takes on the classic burger. But don't be fooled by raunchy descriptions and Ramsey's signature burger puns, like the Bill U Murray Me?, Spamela Anderson, and the Willem DaFoe-nut. This burger freak is a culinary-school-educated chef devoted to the dark arts of hamburgery. Think Maple-bacon wrapped burgers; a lobster burger sandwiched between macaroni cheese buns; and a Pornburger topped with a crispy hash brown nest, truffled sausage gravy, cheddar cheese and a fried egg. Ramsey shows you how to master as many essential cooking techniques as he offers graphically delicious images to ...well drool over! Combining tantalizing meat blends, grinds, and cooking methods, a tempting range of vegetarian and pescatarian delights, and lip-smacking custom ketchups and pickles, PornBurger offers the ultimate dining experience and entices you to create your own culi-naughty adventure. Every element of every burger is open to reinterpretation-with PornBurger, get weird, get wild, and leave no burger fantasy unimagined ...or uneaten. Sold by Wild American Living and ships from Amazon Fulfillment. Former San Francisco Chronicle food writer, photographer, graphic designer and Le Cordon Bleu-trained chef, Mathew Ramsey made his television debut this October on The Food Network's new show The Hungry Games, with Richard Blais and featured on the National Geographic's five-hour food special, EAT: The Story of Food, alongside celebrity chefs and foodies such as Jose Andres, Padma Lakshmi and Marcus Samuelsson. Start reading PornBurger: Hot Buns and Juicy Beefcakes on your Kindle in under a minute. 5.0 out of 5 starsYum!! A customer at the restaurant I work at showed me this book and I fell in love with it. Each recipe has at least one unusual ingredient, but they tell you how to make them rather than some cookbooks that tell you to use some obscure ingredient and you’re like, where do I get that?!? 5.0 out of 5 starsStunning Photography, Fantastic Recipes! If I hadn’t been wooed to buy this book by a goodreads friend's glowing review ([...]...), I wouldn’t have been dreaming of holding this book in my hands, but I ordered it, and it arrived even more glorious in person. It arrived just in time for me to share it with everyone on Sunday, but only after I had taken a picture of the “Cheeseburger Pop Tart” and sent it to my Junk Food loving son. He promptly replied with “Dear God” and questioned if that was breakfast. I laughed. I drooled (although not so much over Cheeseburger Pop Tarts). I dreamed. The names alone are reason enough to be intrigued by this book, which really is a cookbook with amazing recipes. You probably won’t want to prepare these for every day breakfast, lunch and dinner – I take that back, you might / probably will *want* to, but I suspect these are not all “low cal” recipes. These are all worthy of note, these two are the ones I'm choosing for this review: The “Wake ‘n Bacon” which features a maple-bacon wrapped burger, slices of melted cheddar between two apple fritter doughnuts and drizzled with a caffeinated maple=espresso syrup, and the “Mac Daddy Burger, featuring a lobster burger with bacon with a Mac and Cheese Bun. Yes, there is a recipe and instructions for making a bun for your burger out of macaroni and cheese. There’s more. Pork Burgers. Lamb Burgers. Venison Burgers. Lobster burgers. Condiments. Two mustard based recipes and four ketchup-based recipes. Maybe you think you don’t need this, maybe you’ve been happy with your fried chicken or your sausage gravy. Maybe just the section on cuts of meat, preparations, etc. will be what interests you. And then there are the photographs. Really, people take pictures of food they’ve ordered, made, etc., and rarely does it look appealing. The photographs are perfect. Food photography is an art in itself, and Mathew Ramsey gets it oh-so right. 5.0 out of 5 starsGet past the title to some great food !! Aside from the title of this book, this is a great addition to a library of recipes. This was purchased as a gift for a relative. When one in my family saw my purchase, they were taken aback from the title. Shortly thereafter, they were won over after I produced a meal from one of the recipes!!! Great recipes, great read, great gift!!! 4.0 out of 5 starsRated Yum! 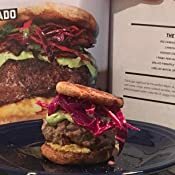 Some awesome burgers in the book, though the only downside is there are some components of the burgers that have no instructions on how to make it, but other then that this book is incredible. 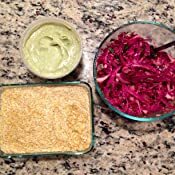 Great for beginners or advance cooks! 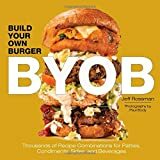 Best burger book I have EVER seen or had, and I have been a chef for over 12 years. Great buy!!!! 4.0 out of 5 starsIt's has very detailed information in it. Amazing good book. Worth the money spent.